BlogHome » What’s Your Biggest Problem/Question About Starting or Running An Online Business? An aeroplane sets its coordinates in advance, but when conditions such as weather change, those coordinates need to be adjusted. This metaphor is similar to setting your goals and targets. You could set a goal a year, 5 or even 10 years in advance but things can change along the way. I’ve set my goals for this year, but goals always change. I’m a big believer in responding to what the crowd wants which is why I started this blog post/discussion. I want to only deliver what YOU want to see because that’s really what I base my content around. Your support and your feedback is super important, and I take every word in. I’m here to help you. What is your most burning questions about starting or running an online business? Are you having trouble trying to generate traffic to your site? Creating products? Setting up your site or blog? How to stay productive? What ever it may be, let me know your biggest concern. Try to be as specific as you can. I’ll be tackling and answering a lot of the questions in future blog posts, videos and my podcast. After you have setup all the tools and gears for your marketing, and you are sure you have done all the above properly…only persistent action will drive to succes. I did not copyed this line but you may say that they are written in any marketing manual. Responsive prospect is our challenge when we need them buy to make us rich! Yes, persistent definitely is a key characteristic we entrepreneurs needs in order to see results. Thank you for your input Francesco. I’ve been online since around 2004 and did have a little success with a particular affiliate program until they did a runner. I just cannot get into a routine, by that I mean being able to put it all together into a paying business!!! Hi Ken. Firstly, thanks very much for your posting your comment. I think this is a big problem a lot of online marketers have, so I’m glad you brought it up. It can all get very overwhelming, but to cut to the chase, I’ve learned to filter out what doesn’t quite meet my current goals and targets. If I know “Software XYZ” isn’t going to help me in this present moment, then I ignore it and move on. Another thing I learned is to only focus on ONE strategy or tactic first. I used to get into a bad habit of buying lots of products, but didn’t end up taking action in the end. Stick to your core method, work it and work it more until you see results. I’ll definitely be noting down this “problem” and will do a blog post or podcast about it. The single biggest factor effecting new marketers or business people who want to make a living online is “Dishonesty in the marketplace” one very good example is a product I looked at purchasing yesterday, which promoted copying a web application to a cell phone, on the surface it looked like a great thing but they used words that were dishonest, so people went and made a purchase, based on a quick reading of the sales copy, they ended up buying a pig in a poke, the product did not work, there was no technical support, the seller did not care they had their money and so just disappeared. The single biggest problem for the new marketer. Hi Thomas. I’m not too sure about the product you purchased, but I understand where you’re coming from. Basically they did not deliver on their promise. They hyped it up and failed to deliver. It’s a common thing to see in this industry, sadly. That’s why it’s getting harder for the rest of the folks who are doing the right thing to gain that trust and loyalty. It’s always good to get a second opinion about a product, or even better try to browse through forums to see if there are any reviews on a product before you purchase. How do you go about figuring out what it is that you want to do online? It’s a little like asking a kid “What do you want to be when you grow up?” but we’re adults here and sometimes I think we’ve lost our ability to figure that out. This is definitely a good subject which I’ll be covering in a future podcast or blog post. … is to bring my online business and income to the next level. I have few years experience. I have several blogs. I have an autoresponder. I have some money that I can spend to grow the business, not much but I can use it optimally. I know the basic things on making money online but I am not yet successful in collecting list and selling from there. Maybe I need a coach to see what I am doing wrong or right. As for what I prefer to see from you. It depends on situation. I would prefer reading article/blogs. But in certain cases, like how to do something in practical, video is more suitable to show step by step. So, bottom line, it really depends on the content you want to deliver. Hi Cyza. Thanks for posting your comment. Yes, a coach/mentor would definitely be able to guide you to the right direction. It’s good to get opinions from a third person. So email marketing and list building is definitely something you’d like help with, and I see that you do have experience with online marketing, it’s just about taking your existing business to another level. Some times it’s mindset that plays a big role. It can stagnate you if you have limiting beliefs. But I definitely want to cover this topic in a podcast/blog post. Yea, my readers seem to react better with step-by-step video tutorials. That’s definitely something I’ll be doing more. Hi Richie. Deliver AWESOME content upfront. I see that you are incorporating that into your plan. That’s your first goal and intention you should always have before trying to even sell anything. You can do this in the form of a blog, videos on YouTube and podcast. Perhaps try creating video presentations. People need to trust you before they take any action. It’s good to see that you’re using a diverse range of traffic methods. You’ll find some that convert better than others. With email confirmations, do you mean getting those new subscribers to confirm their email address to get on your list? Richie, try and put it 100% of your effort to one traffic generation tactic at a time. If you’re doing videos and posting to YouTube, concentrate and creating valuable videos and keep consistent with your postings. There’s a lot of traffic to be made from YouTube. For your email confirmations, it’s always good to make sure you personalize your confirmation message to have a message saying “To download your guide, make sure to confirm your email address below”. And also make sure you have a clear page that tells the subscriber to confirm their email address. At least those who confirm are the ones who want to hear from you. Hey, I’m a newbie IM here from Philippines. And thinking about it, sometimes I’m scary to any offers regarding IM since some MAY not be applicable in our country. My question would be, how would I know if such a product is applicable to another country? Also, I’m thinking about doing IM where my market does not came from my country. Is it possible? Hi Dave. I know a couple of online marketers from the Philippines who are doing well with their online businesses, so geographic shouldn’t be an issue. There should be no reason why you can’t sell your product to another country. Besides, we live in a global and social world. I’m from Australia and my main customers are from the United States. As long as you have the internet, you should have no excuse in running an online business. Yes i have email confirmations thru aweber i also use youtube i have made videos using fiverr but still can”t convert this into sells, i was thinking about making a webinar presentation ,what. Would be the best way to get more emailconfirmations and convert these to actual buys of my ebook? Twitter few words line is forcing thoughts to a very minimum. All the care must be put into link. Sometime links start a bad sequence that may look like a hidden haker activivitiy: pop up, pop down, pop under. Advance user like me, usually paid attention to the varius URL sequence. We understand that there are link-trackers linked pages ect, but what about newbies? Probably they scare to sign-up after many page changes. Who did experience to join the same program after weeks due to misleading OTO sequence? I must admit I am one of those. From my perspective the most important thing for internet marketing beginners is what program you chose to learn from. For example I have great quality personal coach and online courses that I stick to it for one year already. My sales funnel is completed 100%. In addition to it, the biggest traffic factor is in the list building with high quality of paid solo ads. I would recommend clickbanking and adswaps as free traffic sources. It is very important be consistent and do not give up never. Learn from mistakes and go ahead. Good quality of an expert authority blog will help you to communicate with your customers on daily basis. Offer them solutions for their problem. So, I would suggest write content in your article that can resolve customer problem and chose the “straight to the point” topic that they will be able implement in their business right away. Use this few steps: outline, write, edit, proofread & submit. So that is all that you need: an authority blog, article, high quality of sales funnel (squeeze page and good quality free gift, one time offer, thank you page). Then you need: paid traffic (buying solo ads from selected solo ad sellers with high quality of traffic) and free traffic (adswaps and clickbanking) in order to build list of loyal subscribers. Thank you Aurelius for great content. Good tips Kata. I’m sure readers can pick up a few nuggets from your comment. I’m no expert but I consider the biggest hurdle is ensuring that there is enough value in what is being offered by the business. It’s not enough to make an offer or even to have an offer to make. Not only does it need to be compelling but it needs to be something that people want that fills a need in their existence. One other thing is that for a business to last, the offer (or service or whatever, however big or small) ideally needs to irresistible and that people can’t easily get somewhere else (especially if it is a service). If not irresistible it must have an element that still makes it desirable. The most successful business is one where people can’t walk away from what is on offer. I see and receive offers everyday and I am amazed at what people consider to be a offers. What is necessary is a way to measure the extent of an offering before wasting time building a business on it. The easiest way of course is to sell one or hone the offering until it sells. But i’m sure that people give up long before they get there. In my view, no amount of perseverance will fix a business, online or not, if there is insufficient value for the customers. Hi Tony. Right on the money. I agree. Building value is definitely key to creating better content, products and services. Everyone should follow this principle with everything they do. Thanks for your comment. SEO and Traffic are the most people looking for about the truth, because many tutorials out there give many different ways that sometimes not working if applied. Many people frustation to do the best for their sites, because they think so hard and difficult learn about SEO and traffic . Can you post the truth about it? Google’s algorithms always change. There’s no “quick fix” to tricking the search engines to rank your page higher. It’s best to build slowly but surely. Create content that will get passed on, naturally. That’s the best way to get links back to your site. Traffic is a huge topic and one that can get segmented into different sections. I’ll be covering a lot on traffic methods on this blog. I retired from my job 4 years ago, am now 64 years old. I have been trying to earn money from the internet marketing, been learning many things but no real implementation yet achieved. I have been led to greater confusion with so many information and lessons from e-books, video tutorials, etc. 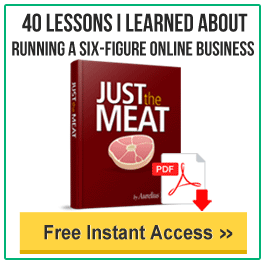 I am very thankful to subscribe to your mailing list as I think you’re one of the few honest gurus of the internet marketing, not seeking only money all the time with sale and sale…. so-called squeeze page or a landing page ? Then, is it necessary to subscribe to an auto-responder, and what to send to the subscribers regularly as I can’t figure out what to say to them ? Is this a necessary step for an Amazon affiliate ? Many thanks in advance, hope that you could ‘enlight’ me on such things. Hi Santy. Thanks for posting your questions, and they’re definitely good questions since a lot of others have the same problems. I understand how frustrating it may be. It wasn’t easy starting out for me, so I can totally relate. I had to learn everything just like you. I keep advising this to my subscribers and that is – the most important thing is to focus on just one system at a time. I see you’ve purchase many products before. I’m sure they outlined their ‘model’ or system. Choose something you can see yourself doing. You’ll get that moment when you’ll say “This all makes sense”. Whether you start with a squeeze page or landing page, it depends on what you’re trying to achieve. Again, it comes down to what you want to do. If it’s promoting Amazon products, then find some training on how to make money with Amazon. You mentioned you’ve been trying but have not really implemented. That’s the missing ingredient – implementation. Nothing moves unless you take action. Don’t worry too much about what to send to your subscribers regularly and all the smaller things. None of that will even be possible unless you have something up and running first. Your site doesn’t need to be perfect. You could easily get a WordPress blog up and running and then start writing reviews of the Amazon products you’re promoting. Take it one step at a time – get your blog installed, sign up for Amazon Associates, post your first blog post, do some backlinking, etc. It’s not going to be easy, but you must start somewhere. Persistent action will give you results. I didn’t know how to set up a website, use an autoresponder, create videos, write an ebook and such. I simply learned from others and then took action. Seek out to those who you find influential and is aligned with your goals. It’s a lot easier modelling from those who have already had success. Being part of a mastermind group would also help with anyone’s success. It’s a good way to share your thoughts and ideas with like-minded people. You group will keep you accountable. Aurelius can better advise you than I but they certainly are not stupid questions. I’d say that more important than the details is to find a product that you would buy yourself and understand why someone would be motivated to buy it -what does it do for them, how would it make them feel etc, how could your offer of it be made fairly irresistible, etc. Then just do it, learn from it, adjust, rinse and repeat. A friend of mine set up a Amazon simple site that sells kettles that he tells me is profitable. Just do the minimum to get it going with the least cost. It does not need to be perfect, wait for no one. Thank you Tony for sharing your thoughts for Santy. You’re spot on that it doesn’t have to be perfect. Good motto to follow. my questions, but I am still waiting for your reply. Tony’s advise, encourages me to try again and stay focused. be misled and could not catch the focus. is willing to ‘hear’ from the newbies.and tries to give some help. Wish you more success ! My most burning question about running an online business is how do you prevent getting demotivated at the start. It takes time! And some days I just feel down about it. The biggest problem is always finding enough time to add new products. The biggest and most troubling problem for me is not the generation of traffic..But maintaining a consistency in traffic generation…Fluctuating analytics haven’t done me any good for me in terms of increasing the advertising potential of the website..